The GoPro camera's are immensely popular. These low cost, tiny and robust camera's are quite unique and since I use one of them for my hobby projects I have decided to give it a review. There are three editions available for the GoPro HD HERO2 which are the Outdoor, motorsports and surf edition. I purchased the motorsports one as it comes with a suction cup to fix it to windows and other smooth surfaces like cars. The content of the motorsports edition. 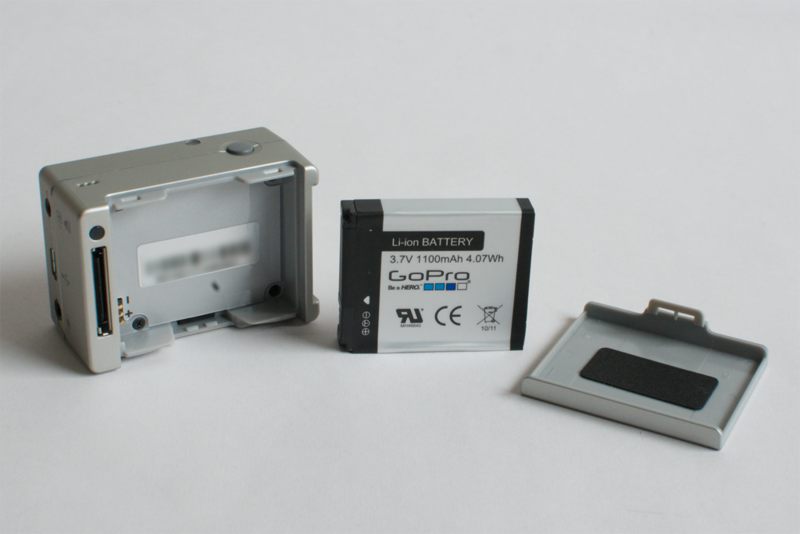 GoPro does not deliver an SD card with the package so make sure you order one yourself. I got myself a SanDisk Extreme HD Video (30 MB/s) 16GB which does a fine job at recording HD video and images. The camera compared to the size of a 1 Euro coin, 1 Pound coin and a Quarter coin. Also check out the informative display. The back of the camera with the Lithium Ion battery popped out. (I blurred out the serial number). Most important part of the whole kit is the camera. It is small and lightweight and could easily fit in your pocket although I do not recommend so as it might damage the lens. The housing is made from sturdy plastic which feels soft to the touch. There are two buttons to control it, an informational LCD screen, a built in microphone, an HDMI out, a TV out, a USB connector and a jack for an external mic. At the back there is also an interface to connect an extra battery pack or LCD view screen which can be purchased as options. There are also four red LEDs which inform you if the camera is filming. PAL and NTSC frame rates. The camera records in the H.264 codec which is similar to a DSLR. You might have noticed the different frame rates with PAL and NTSC. Although in the old days PAL and NTSC used to be incompatible because of different resolutions and frame rates it does not matter too much anymore. As long as you are aware at which frame rate you you are shooting all will be ok. So if shooting slow motion and the end result needs to be 25fps you might as well pick 120 fps as it might give a nicer result. The battery can be charged trough the USB cable but you need the camera to do so. You need to get the optional battery back pack if you want to charge the battery without the camera. The USB cable is also used to unload the movies and images or you can always take the memory card out and put it in a card reader. The image quality is quite crisp and clear in daylight situations. It is only at low light that imagery becomes noisy but then again most camera's have that problem. It is impossible to change the ISO value, shutter speed and aperture on this camera. The interface has had quite an upgrade from the old HERO camera. There is some true readable information now instead of just seeing a digit. This increases the user friendliness as you do not have to carry a manual with you at all times. It also displays useful information such as how much remaining space there is on your memory card, at which resolution and speed you are filming, the battery status and if the camera is in filming mode or picture mode. The front button moves you trough the menu while the top button is used for selections or starting/stopping the camera. The accessories give abundant options on how to attach and point your camera. The pivot arm has big enough handles to tighten and loosening the joints so no screw driver needed to change the configuration. I haven't tried the self adhesive mounts yet so I can't tell you if they stick well or not. The waterproof housing is very sturdy and keeps the camera clean in dirty or wet situations. The two buttons are easily accessible with big buttons from the outside so no need to take it out every time you start or stop it. Again, the new interface is a huge improvement to its usability. I worked with the old one before and it was always a problem if you didn't have the manual with you unless your brain is good at memorizing these things. 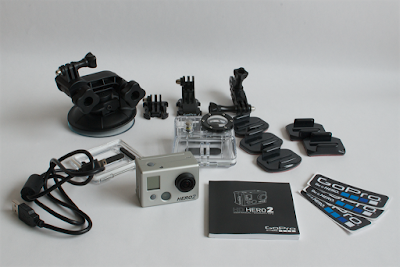 With the HERO2 there is no more memorizing what those digits mean but clear information on how the camera is set up. The display also shows a timer when shooting and how many clips are already on the memory card. The interface sound is on by default but I find the bleeps rather annoying so it is possible to turn it off in the settings menu. You have to dig deep into the menus to find the option but then again it is impossible to have an extensive accessibility with only two buttons and it is not something you have to change all the time. The recorded sound is really muffled when the camera is in the waterproof housing. Make sure to use the skeleton back door if your sound quality needs to be better but keep in mind that it is no longer waterproof when you do so. The menu's on the display are clear and readable although the LCD is not back lit so make sure to have a light ready in low light situations if you need to change some settings. The suction cup works great. Do remember to clean your surfaces before attaching it. Dust can decrease the suction strength over time as air might seep in. And although the waterproof housing is incredibly strong and protects the camera really well, it is never fun when it falls off while driving a car. We also have great fun with the high frame rate option. Unfortunately not at full HD but still a great option to have when doing crazy stuff like jumps. I think there are almost no cameras at this price point which can shoot at 100 fps at this moment in time. A drawback is that you can't see what you are filming exactly so framing can be tricky. 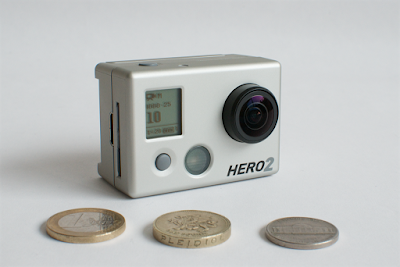 GoPro has thought of this and provides a LCD backpack which makes that possible. Keep in mind that the LCD screen lowers the battery performance. The battery lasts about two to three hours which is not that long and the camera does get a bit hot while in operation so do not be alarmed when that happens. The camera is priced at $299 when ordering from their site. I bought mine in the local shop at 309 Euro. I think the camera is very good value for money considering what you can do with it. Exposure is completely automatic so not much control there but the electronics inside do a pretty good job at getting it right. The camera itself is also quite sturdy as I had a colleague dropping his camera into the water without the waterproof housing and after extensive drying it did still work (maybe he was just plain lucky).